College coaches are evaluating prospects during every single interaction. 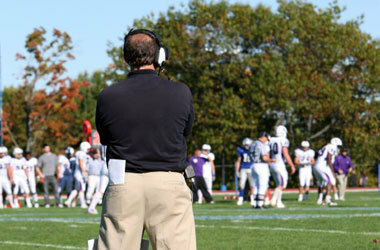 Whether the coach is watching film, talking to an athlete on campus or watching them deal with a loss after a high school game, each observation is a chance to make assumptions about the prospect. It is important for every recruit to understand what sort of things might leave a negative impression with a college coach. After surveying and interviewing former and current college coaches, we came up with a list of the most common “turn offs” that ALL recruits should be aware of! In no particular order: - Student athletes asking about scholarships on the first email or visit they have with the coach. - Student athletes being rude to their parents. - Student-athletes acting like they are “too good” or above that particular school. - Student athletes coming to a visit unprepared. For example, having no prior knowledge of the school or team. - Student-athletes being quiet on the phone with only one word answers to their questions. Coaches understand that prospects can be nervous, but make sure you do not seem disinterested! - Student-athletes not being honest about their interest level in that school. - Student-athletes who call or email too frequently. - Student-athletes acting inappropriately on a recruiting visit. For example, partying too much. - Parents being too involved. - Student-athletes who misrepresent their academic and athletic information. - Student-athletes not responding in a reasonable amount of time. - Student-athletes not providing the necessary info. For example transcripts and video. - Student-athletes who do not personalize their correspondence with college coaches. For example, writing an email or a letter with “Dear Coach” instead of using the actual last name. - Student-athletes arranging a campus or home visit and not showing. - Unrealistic opinion and promotion of the student-athlete by parents, high school coaches, or the athletes themselves. Do any of those sound familiar? If so, you are not alone. Many athletes and families make mistakes throughout the recruiting process. The list above certainly is not all encompassing and there are many other pitfalls a recruit can succumb to. In most cases, the mistake might not immediately result in a prospect’s name being crossed off the list, but it certainly will not help…and given the importance of this process, why risk it? Think about it like this. A college coach is looking at two prospects. Both have almost identical academics and athletics. One prospect comes to a recruiting trip and parties too much and misses curfew while the other gets to bed on time and has a productive visit. Which prospect do you think will be higher on that coach’s recruiting list? Read more in the NCSA College Athletic Scholarships Blog Join the NCSA Athletic Recruiting Network by building a free Recruiting Profile to help you connect with college coaches click here!